When Lillebror's mother is mysteriously hurt in a biking accident, Lillebror and Knerten turn the town upside down trying to find the culprit. Third film about the wooden stick. Little Brother has moved with his family, and a stick son has seen the day of light, but there is no new friends. Lillebror moves with Knerten and his family to the western part of Norway, but dreams of even bigger expeditions, like going to the North Pole. A great family film. Now I have actually seen this alone, although I am an adult (a little embarrassing to admit) and I actually enjoyed this film. 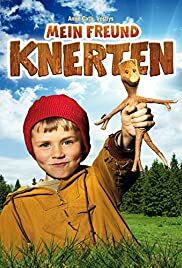 I grew up with 'Knerten', and to see it become this film is simply funny. Lillebror is played by a beautiful boy and Åsleik makes a wonderful role as Knerten's voice. It is a film that you can take your children too, without feeling that you are bored to death. Comments and scenes in between makes you smile. For children i believe this is exciting and fun, and for adults (at least if you have read the books) may not be quite as exciting, but charming and fun! With the exception of the two girls, which annoyed me he-he, I can not handle kids like that ... But it makes a bit of the history, I believe! All-in-all, a feel-good movie, which you can see with the kids without being afraid you will fall asleep!